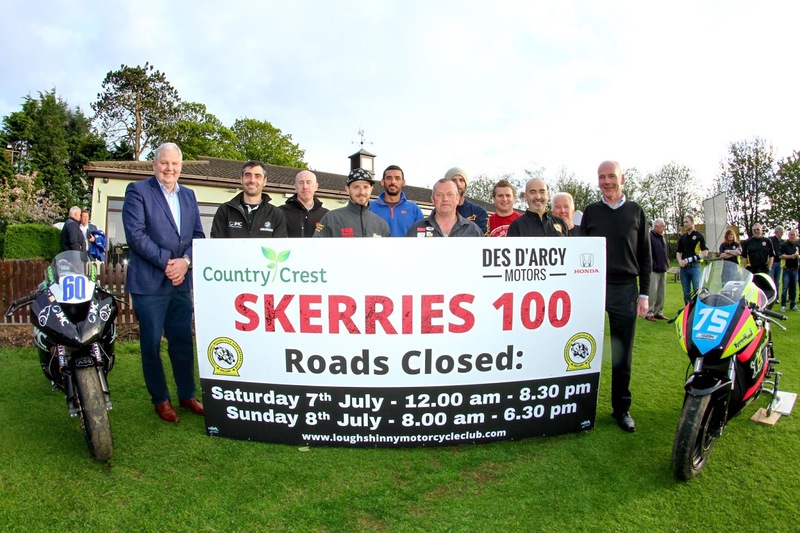 Loughshinny Motorcycle Supporters Club are delighted to announce, that two of the clubs extremely loyal sponsors, Country Crest & Des D'Arcy Motors are joining forces as title sponsors of the iconic Skerries 100 Road Race. Both of these sponsors have been associated with the club for many years, and we are really looking forward to working with them both. 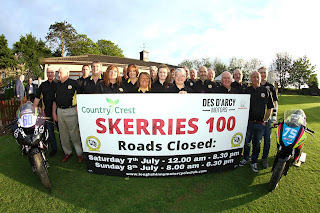 With a break in tradition, this year’s event will take place on Saturday and Sunday, 7th July and 8th July over the demanding 2.9 mile seaside course, and with all the recent debate surrounding the insurance crisis, we are proud to have great sponsors supporting the famous “Skerries 100”. 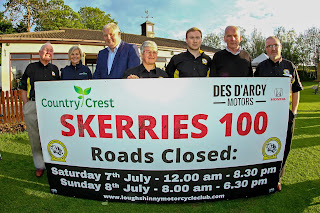 The support we have received from our loyal sponsors over the years has help us to keep this historic race going and our very proud to announce the following sponsors, Axa Bike Care, HMS, B&V Nurseries, Kennedy’s Motorcycles, Sam Dennigan & Co., The Seaver Family, ASM, Ollies Place, C&T Supermarkets, Convent Lane Motors, Mc Nally & Co Accountants and the People's Race. 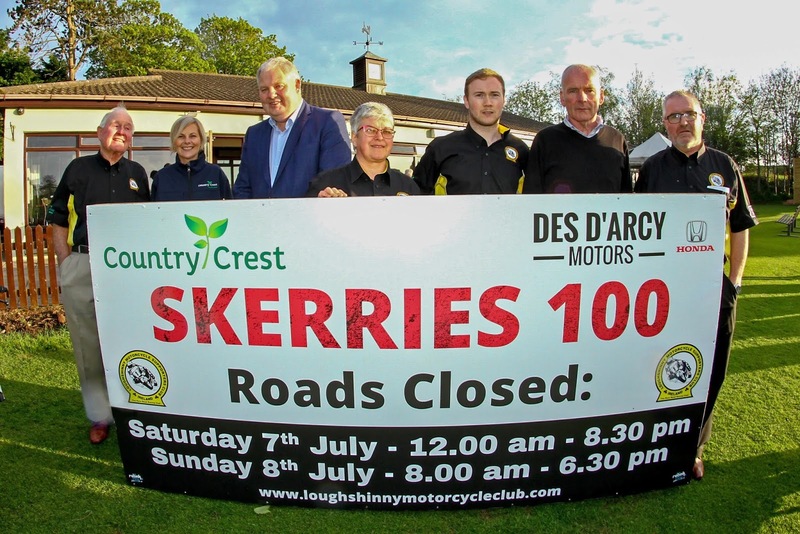 In addition we have a new race sponsor Hughes Sales and Service Ltd.
Susan Plunkett, Chairperson LMCSC, and Clerk of the Course; I am delighted to be involved with the organisation and running of this wonderful, dynamic, iconic and historic event. We have a really strong committee and race team and they have been working tireless in the background to put all the pieces of this wonderful event together. We have made a historic change to Saturday and Sunday so would really appreciate if the word about this can be spread. I would like to thank our title sponsors and all our individual races sponsors, our advertisers and all the people who give us provisions or money to help us facilitate the event, you loyal support over the years is greatly appreciated by all our members. We have a full race programme to put on and the circuit preparation will be key to this, so for anyone who wants to come along and help we meet on a Wednesday at 8.30pm in the Hills Cricket club from now until the event. Track preparation will begin on the 18th June and this is crucial to our success, so if you think you can help with someone please get in touch with us or any of our members all help is very much appreciated. 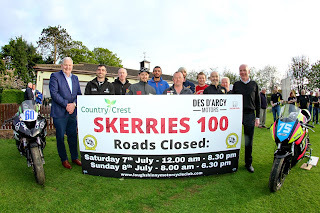 And finally a huge thank you to our landowners, residences, officials, Fingal County Council, An Garda Siochána, Motorcycling Ireland, marshals, Man-o-war GAA, Hill Cricket Club, Milverton Off-Road and everyone who helps with our event. As we are all well aware that the cost of running Irish Championship road racing, is escalating, and we are keeping the cost of the two days practice and racing at just €25, and that will include a race programme. We are hoping that all road race fans will dig deep to help the future of racing, and buy their admission arm band, that will help the club with the cost of the event. 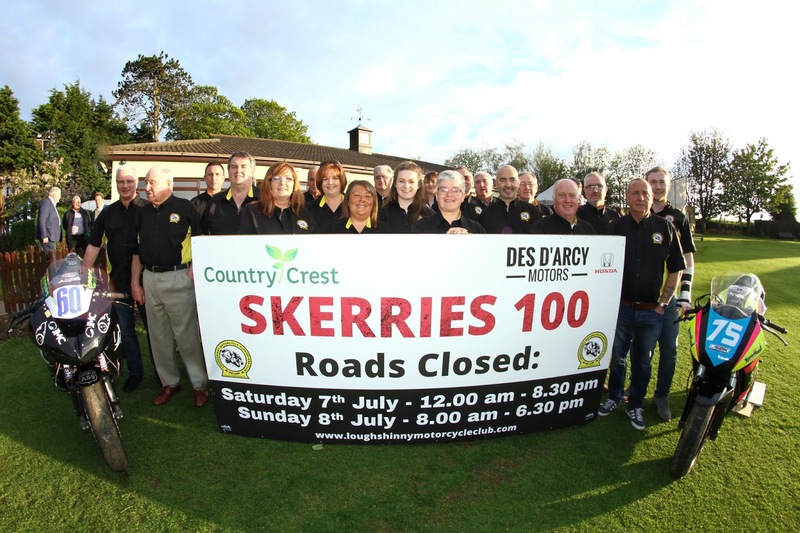 Proceedings will start with the Annual Classic Parade that will take place on Friday 6th July, with sign on starting in Skerries Mills at 5:30pm, and the run itself at 7.30pm. The entry fee of €10 for the parade will all go to the MCI Medical Team who have started to fund raise for a vital piece of equipment which they current use but it has reached it final year of operation. The vital piece is a LifePak 15, and the cost will be €23000, which we need to raise between now and the end of the season to get ensure that we start 2019 with it. Roads will close on Saturday 12 noon for practice, and will re-open no later than 8:30pm. On Sunday 8th July, the roads will close at 9.30am, and re-open no later than 6.30pm. For more information please log on to the clubs website www.loughshinnymotorcycleclub.com, or contact the club on 086-0447478.